← Elegant Black and White Mixed Bunch Boxed Card Set – Stampin’ Up! Stampin’ Up! 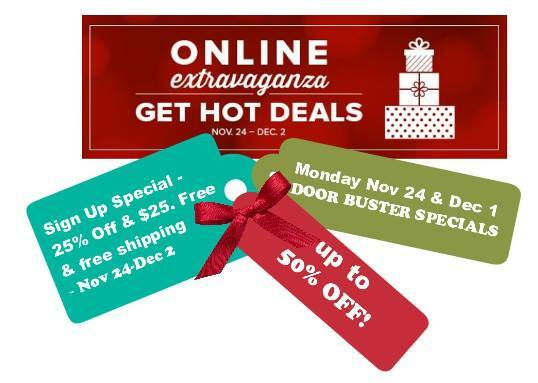 Online Extravaganza November 24-Dec 2! This is my second post for the day, click here to see my Elegant Black and White Mixed Bunch Boxed set. Here is the list for the Stampin’ Up! Online Extravaganza that will be starting on Monday, November 24 and running through Tuesday, December 2…get your shopping lists ready!! To see the list in PDF form for easy printing, please click here. Be sure to double check those doorbuster dates to make sure that you don’t miss out on those great deals. And don’t forget that the deals are only available while supplies last. Holiday Sign Up Special… The Best Bang for your Buck! Click the images below to order the weekly deal products from my online store. The Weekly Deals are only while supplies last and only available at these great prices through November 24th.